Celadon, a label focused on electroacoustic and improvised music from Korea, is proud to offer its second release, a CD recording from Hong Chulki, Jin Sangtae and Kevin Parks entitled “音影” or “Eum-young” in Korean pronunciation. The title is a kind of neologism involving an alteration of the first character in “陰影,” which also is pronounced “Eum-young” in Korean. The original word, “陰影,” means “shades and shadows, and refers to “shades” or “chiaroscuro” in Korean. The neologism involves replacing “shades” or “陰” with “sound” or “音,” which shares the same pronunciation in Korean. Just as the word “chiaroscuro” refers to the contrast of light and shade in the visual and cinematic arts, so to does 音影 suggest the contrast between sound or noise and silence in the recording, the delicate balance of allowing both sound and its absence to produce or suggest meaning in the performance and recorded work. Hong Chulki has been involved in experimental music in Korea for well over a decade. He has worked in the noise duo, Astronoise, with his frequent and long term collaborator, Choi Joon-yong. He has also recorded and performed with the Seoul Frequency Group, a quartet that included both Hong and Choi. He has also recorded and performed with Seoul-based American expatriate, Joe Foster, and the Relay series host and Manual music label owner, Ryu Hankil. Recently, Hong has traveled and performed extensively in Europe, Japan and other parts of Asia. Jin Sangtae is the host and program director of the Dotolim experimental music series in Seoul and has frequently recorded and performed in the Relay series as well as other events. He has performed regularly in Japan and Europe and his solo CD, “Extensity of Hard Disk Drive” was released on Choi Joon-yong’s Balloon and Needle label. Kevin Parks is an American guitarist, composer, and electronic musician who has lived in Korea off and on since the early nineties. This CD is his third recorded effort after two highly acclaimed collaborations with Joe Foster. This trio collaboration was produced during several recording sessions at the Dotolim studio in 2010. Parks edited, mixed and mastered the recordings. 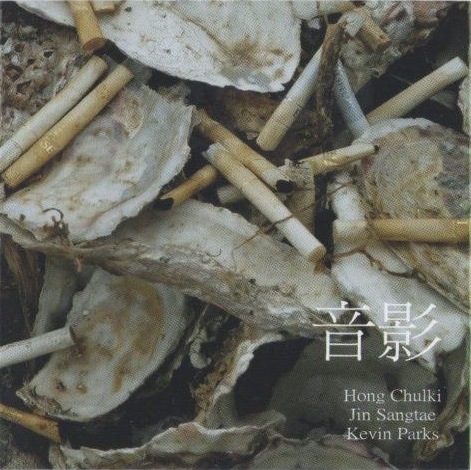 Ryu Hankil carried out the production design, and the photograph came from former Korean resident, Shane Bondi, who captured an image of the detritus following a typical Korean drinking scene, where oyster shells become makeshift ashtrays, the organic fused with mass produced commercial product, the detritus itself suggesting or mirroring that of the sonic detritus becoming a sound source for the recording as merged with the organic sound of Parks’ guitar. 음 들어보고 싶은데 어떻게 구해야 할지..
http://thebooksociety.org 에 문의하시면 됩니다. 여기 리스트에 올라 와 있지는 않은데요, 입고 되어있으니 구입 방법을 안내해 주실 거에요. 아니면 닻올림 연주회에서도 구입 가능하세요. http://dotolim.com 으로 방문해 주셔도 되고요, jinsangtae at popmusic25.com 으로 메일 오더를 신청해 주셔도 됩니다. 고맙습니다. 하드디스크의 확장 이라는 앨범을 들어봤는데, 생경하면서도 제목부터 음악까지 무척 좋았어요. 이런 종류의 감수성을 표현하고 발표하시는 분이 있어서 감사하다는 생각이 드네요. 관심 가져 주셔서 고맙습니다. 메일 보내드렸으니 참고하셔서 송금해 주시면 될 것 같습니다.